The Type I Tridents of Zhytomyr are not a local issue but the regular issue of a Postal District, Volhynia - in Imperial Russian times, Volinsk Guberniya. It is irrelevant that they were quite quickly replaced with overprints supplied from Kyiv and overprinted with Kyiv Tridents. As mint stamps, they are a nightmare - the ink is a distinctive bright violet but is so fluid that often the Trident impression is no more than a smudge or a blob. Mapping an individual Zhytomyr Trident to its position in one of the three multiple cliches apparently used (see Bulat page 18) is generally impossible. It is really only the ink that tells you that what you have is a Zhytomyr Trident (Type I). In the top row, a strip of three used at LUGINI VOK [ = Volinsk] 1 10 18. This strip is signed Dr Seichter. Luginy is a small town north of Zhytomyr and closer to Ovruch. Bottom left, ZDOLBUNOVO VOL 12 9 18. Zdolbuniv also issued its own Local Trident, most commonly found on the 1 rouble imperforate but this is clearly not that type. This stamp is signed UPV and Schmidt. The town itself is west of Zhytomyr just south of Rivne. 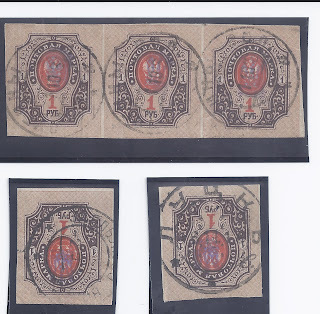 Bottom right, LUTSK 8 11 18.This stamp is signed UPV and Schmidt. The town is in the far west of Volhynia, geographically closer to Lviv than Zhytomyr.